The prehistoric cookie-cutter cat was not as cute as the name suggests. That’s especially true when you consider the fossil felid’s scientific label — Xenosmilus. That roughly translates to “alien knife”, and the name certainly fits. Xenosmilus was not a sleek, gracile beast like modern cheetahs, leopards, or tigers. This was a heavily muscled sabertooth which may have looked like a cat adapted into the shape of a bear. Even compared to other long-fanged cats of prehistory, Xenosmilus was a weird one. The unique nature of Xenosmilus was not immediately clear when the cat was discovered. During the early 1980s a group of quarry workers toiling away in the Florida heat accidentally uncovered a cache of roughly one-million-year-old bones as they were destroying a patch of limestone. Peccary bones dominated the site, so much so that the pit became known as “hog heaven.” But there were sabercats in the mix, too. These fossils were quickly grabbed by the local commercial fossil collector Larry H. Martin — not to be confused with paleontologist Larry D. Martin, who would later name Xenosmilus — who subsequently split the two individuals up. While Martin donated one to the University of Florida, the other was kept in private hands. At the time, the two partial sabercat skeletons were thought to have belonged to a widespread form called Homotherium serum. This wasn’t very exciting. Earlier excavations of Friesenhahn Cave in Texas turned up signs that the site had been a Homotherium den — including the skeletons of juvenile sabercats — and the previous description of these remains and others reduced interest in the Florida bones. 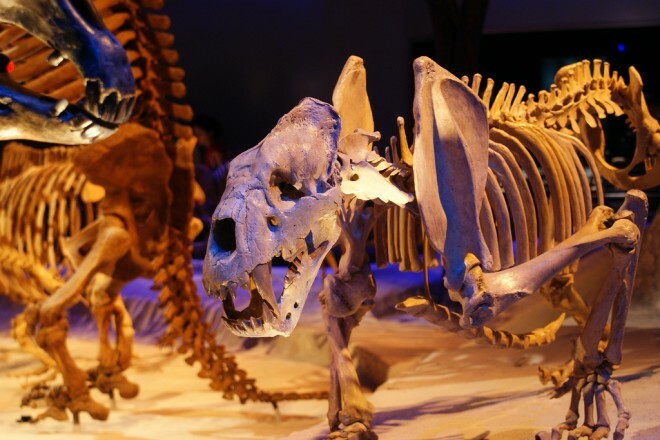 It wasn’t until the late 1990s that paleontologists realized that the sabercat skeletons represented an animal strikingly different from Homotherium. Up until the discovery of Xenosmilus, the saber-toothed cats of the past 23 million years or so have been categorized by paleontologists into one of two categories on the basis of their dental cutlery and body shape. The dirk-toothed cats — such as the famous Smilodon — had long, slender canine teeth and relatively stocky frames. These cats were not pursuit predators, but carnivores which ambushed their prey and quickly wrestled horses, bison, and little mammoths to the ground with powerful forelimbs. The other group — dubbed scimitar-toothed cats — are thought to have opted for a different strategy. Scimitar-tooths such as Homotherium had shorter, broader canine teeth and were generally more slender, long-legged predators. Like cheetahs of the African savanna today, these cats may have been experts at tripping up fleeing prey before delivering a killing bite to the throat or belly. Xenosmilus doesn’t fit into either category. In evolutionary terms, studies by paleontologist Kurt Spearing and others have shown that Xenosmilus was most closely related to scimitar-tooths like Homotherium, yet the cat was clearly a different kind of predator. That’s what led paleontologist Larry D. Martin and colleagues to title their short paper which first described Xenosmilus “Three Ways To Be A Saber-Toothed Cat.” With short, broad saber-fangs like those of the scimitar-tooths, but with a more robust skeletal frame which resembled that of the dirk-toothed cats, Xenosmilus has been cast a unique evolutionary mosaic which incorporated characteristics from both of the previously-defined types of sabercats. That’s almost all there was to say about Xenosmilus for over a decade. There was only the short initial description, in addition to a few mentions of possible Xenosmilus fragments found outside of Florida, but now Larry D. Martin, John Babiarz, and Virginia Naples have followed up with a lengthy, detailed study of the two partial skeletons in the book The Other Saber-Tooths: Scimitar-Tooth Cats of the Western Hemisphere. The bulk of the new paper is pretty standard stuff — dry descriptions of vertebrae, limb bones, and the like — but the fact that Martin, Babiarz, and Naples are now calling Xenosmilus the “cookie-cutter cat” jumped out at me like a Smilodon leaping out from the tall grass. How did such a formidable predator end up with such a cutesy same? 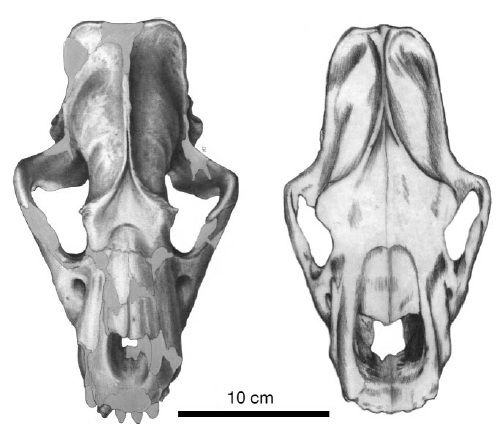 An illustration of the reconstructed skull of Xenosmilus (BIOPSI 101; left) compared to the skull of Homotherium serum (right). The lighter, undetailed portions of the Xenosmilus skull are the parts which were missing. From Martin et al., 2000. In the upper jaws of sabercats like Smilodon, there is a significant gap between the canines and the battery of smaller, closely spaced incisor teeth. The way this arrangement actually functioned has often been debated, but it appears that the saber-fangs slashed through flesh in an arc while the forward-jutting incisor battery was useful in scraping flesh from bone. (Incidentally, the unique battery of incisor-like teeth in Tyrannosaurus rexmay have allowed the famous dinosaur get the most from carcasses in a similar fashion.) In Xenosmilus, however, there doesn’t appear to be any large gap between the large upper canines and the upper incisors. The teeth appear to be part of a single unit rather than different tools used for different purposes. What the complete incisor battery of Xenosmilus would have looked like requires a bit of reconstruction. In the better of the two known skulls — BIOPSI 101 — almost the entire incisor battery is missing save for one large incisor tooth bordering that left canine and the second incisor on the right side. Nevertheless, the left and right sides of the upper jaw would have been mirror images — what is present on the right side can be flipped to fill in the missing parts on the left, and vice versa. When this is done, only a small section at the very front of the upper jaw is missing. Instead of having a battery of smaller, closely packed incisors, Xenosmilus had more widely spaced, roughly oval, and serrated incisors which — with the formidable canines — created an arc of sharp teeth. Rather than trying to trip or tackle prey and then deliver deadly slashing bites, Martin and colleagues hypothesize that Xenosmilus had a different killing method. “As the jaws closed,” Martin and co-authors wrote in their new description, “a large bolus of meat was extracted.” This cat was not a quick and elegant killer. If these paleontologists are correct, then Xenosmilus tore away large chunks of flesh from the flanks or abdomens of fleeing prey until the animal died of shock and blood loss. The mouth of this cat may have acted as one of the deadliest cookie-cutters of all time. Top Image: A reconstruction of Xenosmilus at the Florida Museum of Natural History. Photo by Flickr user Dallas Krentzel.